We’re delighted to announce that this year we’ve raised an impressive £2,500 for Shelter! This marks the £30k raised barrier (precisely £31,100) since we started back in 2001. All of this wouldn’t have been possible without you – a big THANK YOU to everyone who’s performed, helped out, baked a cake, manned a sound desk or merch stall or bought a ticket and come along since 2001. With less than TWO WEEKS to go until Audioscope15, we have some bad news -sadly, Guapo have decided to pull out of this year’s festival at this late stage. We’re really sorry for any disappointment this causes for those of you who – just like us – were looking forward to seeing them. However, we won’t let this dampen the spirits and we are looking forward to celebrating our 15th birthday with all the incredible artists below. We hope to see you there – if you haven’t bought your ticket yet, do it now – all the money we raise goes to Shelter! Also, did you see what the music press has to say about Audioscope? Check out The Wire, The Quietus, The 405, local music magazine Nighshift and a special 15th anniversary playlist we’ve done for Q Magazine. 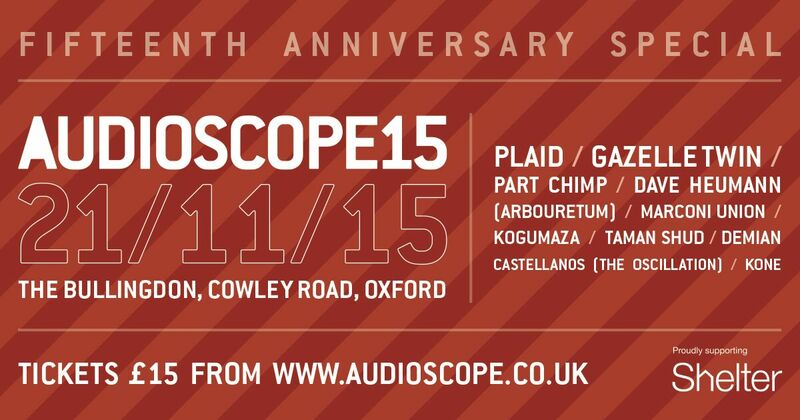 AUDIOSCOPE15 lineup announced – Plaid, Gazelle Twin and more! When we started out in 2001 with the idea to fill one day with as much amazing music as we could find, we didn’t even know there’d be a second edition, let alone that we’d be celebrating our our FIFTEENTH birthday. And here we are, ready to announce the lineup for AUDIOSCOPE15. The show will be headlined by electronica legends Plaid, while The Quietus’ Album of the Year 2014 Gazelle Twin will be performing this intimate show for us just days before her headline date at the Barbican. At the noisier end of the lineup, we have a rare show from the UK’s loudest band Part Chimp (who plaid the loudest AUDIOSCOPE show in our history at our warmup show in 2004), prog-kraut veterans Guapo, the hypnotic grooves of Kogumaza (with three-times AUDIOSCOPE veteran guitarist Chris Summerlin) and necro-psych Londoners Taman Shud. We’re delighted to bring back Thrill Jockey’s latest signing Dave Heumann, who will be performing as part of his debut European solo tour with members of Trembling Bells and his former band Arbouretum (one of the stars of AUDIOSCOPE in 2012). We’re also pleased to have Demian Castellanos of long-standing favourites The Oscillation, who will present his solo work blending Indian ragas with enveloping electronic drones and pulses. On a break from new work in the studio, Manchester-based ambient innovators Marconi Union – authors of ‘the world’s most relaxing song’ with the British Academy of Sound Therapy – will perform an exclusive improvised set just for us. One of the hottest new local prospects on the block, Oxford’s Kone promise ‘art music for guitars’, and deliver on the idea that pop music can both move the heart and stimulate the brain. 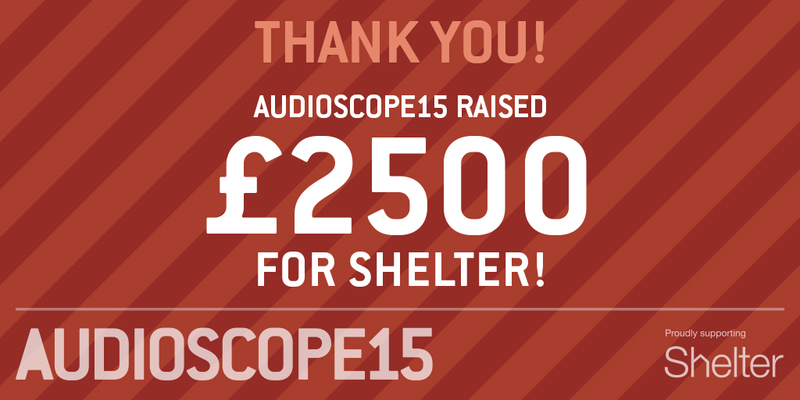 Since 2001, more than 200 artists from across the UK and beyond have supported Audioscope, raising almost £29,000 for Shelter. 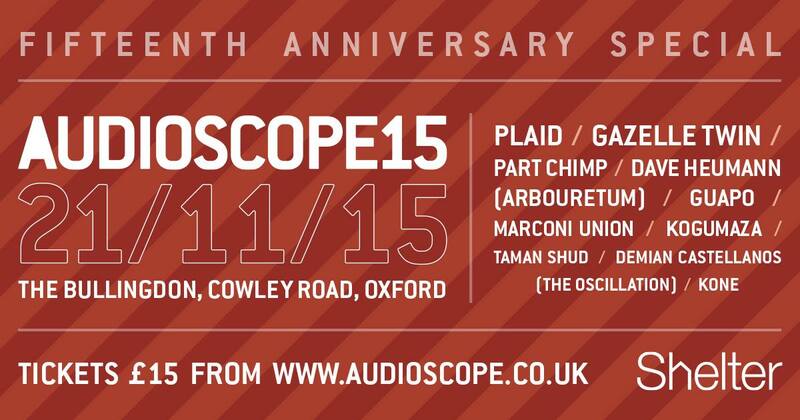 Audioscope 2015 takes place at The Bullingdon, Cowley Road, Oxford on 21 November 2015. Tickets are available now for £15 in advance from www.wegottickets.com/audioscope. AUDIOSCOPE15 – save the date! 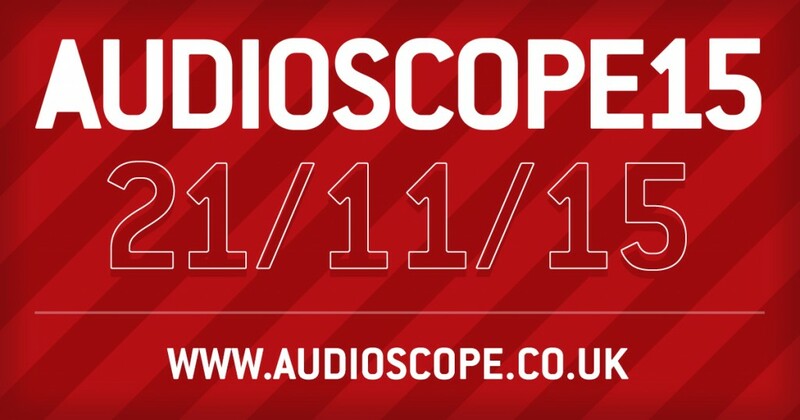 We’re delighted to announce that Audioscope will be on Saturday 21 November 2015. We’re particularly proud to say that this will be our 15th anniversary, so we’re working hard to make this a show fitting such a landmark year. We hope to see as many of you there. Keep checking the website, our Facebook page and Twitter feed for the lineup announcement and more updates!